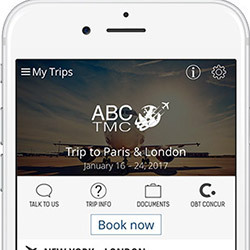 Does Your TMC App Meet Your Clients’ Needs? A recent survey made on behalf of American Express GBT, shows that since 2014 companies have changed their priorities when it comes to business travel. Due to recent events, security has become a primary focus and has therefore shifted to first position since 2014. 45% of the companies that participated in the study, want to improve their process by implementing new booking tools and expense management software. Previously at the 6th position in 2014, business traveler satisfaction has made a real jump.